Boston University School of Medicine (BUSM) is at the South end of Boston, adjacent to the principal teaching hospital. It was founded by merging with New England Female Medical College in 1873. It is a well-known research institution and is ranked 12th in the US medical schools for sponsored research. Boston University School of Medicine provide educational programs to 1700 MD and graduate students, with 1200 qualified full-time faculty to provide with the professionals like no other. Their core mission is to train the best physicians and scientists. As health sciences is a constantly evolving field, the research program offered by Boston University is a manifesto to explore the information that is yet to be mastered. The committed faculty, positive environment, state-of-the-art learning facilities, and clinical experience in Boston’s best teaching hospitals is the key to generate skilled experts. The campus has clinical services as well as global health initiatives. Faculty and students from BUSM run a medical clinic that serve refugees from war-torn countries. They have massive research programs in cardiology, cancer, neurosciences, and infectious diseases. Boston University School of Medicine is committed to the environment that is professional, collaborative, and supportive for all personnel that provide the best possible patient care, teaching and research. All the faculty and staff are expected to model the behavior that shows responsibility, excellence, empathy, efficiency, improvement and team work. Boston University School of Medicine is accredited by renowned departments i.e. Liaison Committee on Medical Education of Association of American Medical Colleges as well as its council. 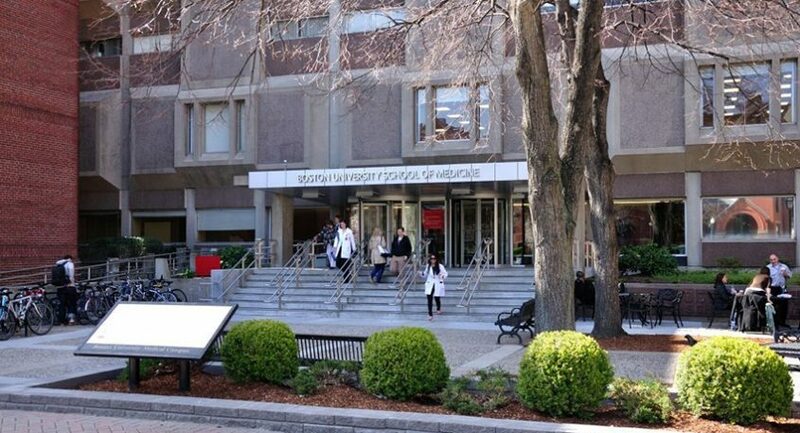 Residency programs at Boston University School of Medicine are authorized by the Accreditation Council for Graduate Medical Education of American Medical Association. Boston University School of Medicine is a very named and famous institute which is continuing to educate and polish the emerging doctors and medical professionals by offering different programs that are accredited by Accreditation Council for Continuing Medical Education and American Medical Association. BUSM curriculum ensure students to study medicine in a healthy, flexible and supportive environment that stimulates critical inquiry and impart the sound knowledge of medical sciences, clinical experience, social and behavioral education. The vast clinical experience help the students to gain maximum practical knowledge of the theoretical aspects of their studies. Over the past several years, BUSM have designed the academic program in such a manner that have reduced the lecture hours and expanded the laboratory sessions, problem-based seminars and small group exercises that has proven to amplify the flexibility in BUSM medical professionals.First year of study targets the normal structure and function (anatomy and physiology). Second year shifts the focus to anomalies in structure and function (physiology and pathophysiology). Third year is core clerkship year in which students complete their clinical rotations, ambulatory and inpatient practices. Fourth year emphasizes on advanced clinical rotations, a sub-internship in specialty of their choice. In addition, students are given opportunities to pursue clinical or basic medical research. Boston University School of Medicine has been educating medical professionals from the past 150 years. The curriculum focus on the patient care in Introduction to Clinical Medicine, professionalism lectures and Exercise in Human Behavior in Medicine. At the same time, they begin their study of Essentials of Public Health. The side by side clinical exposure allow students autonomy in an educational setting. For admission in Boston University School of Medicine, candidates must apply through American Medical College Application Service. Students may apply between 1st June and 1st November. Early applications are appreciated. Applicants are expected to earn a bachelor’s degree from a four-year college or university that is located in and accredited in the U.S. or Canada*. Applicants currently enrolled in a professional or graduate school program must be in the terminal year of the degree program for applying for admission to the first year class in BUSM and all candidates should complete any academic program in which they are enrolled at any time during the application process.Applicants who have not graduated from an accredited U.S. or Canadian institution, but has completed a minimum of two years in such an institution, including all of the prerequisites, may be considered to be eligible and should bring the details of their record to the attention of the Committee on Admissions. All prerequisites must be completed before a student can register at BUSM. Applicants are appreciated if they acquire a broad experience in the humanities as well as in the behavioral and social sciences during their college years, along with the courses in Mathematics (particularly statistics), Biochemistry, Social and Behavioral Sciences (Psychology, Sociology, and Anthropology), Genetics, and Molecular Biology are considered pivotal. Applicants who have graduated from an undergraduate premedical program which offers a Health Professions Advisory Committee letter should submit a letter from this committee. If no such institutional letter is available, the applicant can have some help in this matter by BUSM supplemental application and substitute a minimum of three individual letters, two of which should be from a professor who has taught Biology, Chemistry or Physics (or other similar classes). The third letter can be from a person of choice. Applicants to the MD PhD program, should submit a fourth letter from a research advisor. Boston University School of Medicine also accepts letters electronically through the AMCAS Letter Service. Medical College Admission Test (MCAT) is recommended for all the students who want to apply for Boston University School of Medicine. The information regarding the examination is available on the official website of the Association of American Medical Colleges. The oldest MCAT scores valid for admissions in 2019 will be the April 2015 tests. Applicants are encouraged to take the MCAT in the spring of the year of application. The requirement for degree of Doctor of Medicine at Boston University is that candidate must be at least twenty-one years of age and a sound moral character. All the essential requirements must be fulfilled at the time of admission. The committee evaluates the academic record, college recommendations, and involvement in college and community activities as well as qualities of personality, character, and life experience. A personal interview at the discretion of the Committee on Admissions is a main part of the admissions process. The MMEDIC program admits a selected number of students who have completed two years of undergraduate study in the College of Arts & Sciences or other undergraduate colleges at Boston University. Modular courses are taken by students at junior and senior year that not only enable them to fulfill undergraduate requirements, but also allow for the completion of certain requirements of the curriculum of first year of the School of Medicine. The Early Medical School Selection Program was developed to include students from colleges with large hispanic populations and Indian Health Service. Students accepted into the program will remain within their undergraduate colleges through the junior year and must complete the maximum courses before entering the senior year at Boston University. Upon performing at the expected level, the students will matriculate into School of Medicine at Boston University. Upon meeting the academic requirements of School of Medicine, the degree of Doctor of Medicine will be granted by Boston University. The College of Arts & Sciences and the School of Medicine of Boston University offer a combined curriculum that is designed for students who are pursuing for full academic years of secondary education and the students who have completed high school but have not enrolled in any college. In first three years, students study in College of Arts & Sciences, where they take premedical sciences and electives in humanities and social sciences. After the completion of required premedical courses in the first two years of study, students may enroll in certain modular medical courses in the third academic year. In addition, the student has three summers completely free for pursuing other interests. This program is offered by the School of Medicine and the Division of Graduate Medical Sciences in Boston University School of Medicine. This program is designed for highly qualified individuals who are strongly motivated towards a career in both medicine and research. The detailed information is available on the main website. The Doctor of Medicine/Master of Public Health Dual Degree Program at Boston University School of Medicine and Boston University School of Public Health is designed for medical students who envision a medical career that include both public health and medicine. The MPH curriculum emphasizes on both knowledge and skills that allow students to achieve mastery needed for public health practice. The detailed information is available here. The MD/MBA combined program is offered under the collaboration of the School of Medicine and the Graduate School of Management. This is a five-year program that is intended for students interested in both medicine and the business aspects of medicine. The detailed information is available here. The dual Combined MD/MS in Clinical Investigation (MSCI) program a versatile program, combining traditional MD program with in-depth clinical research training. The program is designed for those students who are interested in pursuing careers in the areas of medicine and clinical research in either an academic environment or pharmaceutical or biotechnology industry setting. The detail of this program is available here. The dual MD/JD program loops in the MD degree with a JD degree at a top law school providing graduates with a full law degree in the concentration of their choice. This is a core six-year program that is intended for students interested in both clinical medicine and the legal aspects of medicine; the health law or policy issues, health care legislation, or programs to end health disparities. The information is available here. This program is a collaborative effort between Boston University Schools of Medicine (BUSM) and Goldman School of Dental Medicine (GSDM). It provides the rare opportunity for 1-2 selected individuals per year in GSDM Oral & Maxillofacial Surgery residency program to the Doctor of Medicine (MD) degree concurrently with the Boston University Certificate of Advanced Graduate Study (CAGS) in Oral & Maxillofacial Surgery. The program 6 years long with all the details mentioned here. Boston University is an excellent research platform for the students in the evolving world. Aside from all the medical centers and public health centers, university also has a 16 acre biotechnology research park. The BioSquare development project is a massive plan to meet the future research needs of the medical campus in Boston University and provide research space for biotechnology and pharmaceutical corporate tenants. There is approximately 3141,000 sq. feet of research space and more than 30,000 sq. feet clinical space supporting the needs of three medical campus schools.On the average, more than 78% students participate in the research projects and electives. Research includes basic as well as clinical investigations. Other major affiliations include Quincy Medical Center, Roger Williams Medical Center, Boson VA HealthCare System, Framingham MetroWest Medical Center and more than 20 general and specialty hospitals in Maine, Massachusetts, and Rhode Island. Boston Medical Center is a private, not-for-profit, 487-licensed bed, academic medical center that provides approximately 1.1 million ambulatory patient visits, 133,000 emergency department visits, and more than 25,000 hospital stays each year. It is a primary teaching hospital affiliated with Boston University School of Medicine and was created by the formal merger of Boston City Hospital and Boston University Medical Center Hospital (BUMCH) in 1996.Boston medical center is the largest safety-net hospital that provides a full spectrum of pediatric and adult care service, from basic medical care to advanced specialty care. In addition to this, there are outreach programs, particularly for city’s homeless population. Nationally recognized services of Boston Medical Center include cardiovascular medicine, cancer, trauma, geriatrics, Parkinson’s disease, arthritis, infectious diseases including AIDS, and spinal cord injuries. It is the largest not-for-profit integrated health care system in the United States, facilitating people with health care 9 million people in 8 U.S regions. Boston University School of Medicine has partnered with Kaiser Foundation Hospitals to establish a branch in North California to provide clinical clerkship rotation. Boston School of medicine enable all motivated all talented and medical students to achieve their academic and professional potential. The total dues are $60,864 per year. The detailed Tuition Fee is given here. Student Financial Services (SFS) provides students with guidance to manage financial aid while studying at Boston University Medical Campus (BUMC) as well as the resources to be financially successful upon graduation. SFS support both prospective and continuing students to have access to SFS staff year-round by email, phone, or in-person. The applicant will be asked to provide information about the family’s income and assets in order to fulfill all the formalities of the Student Financial Service. School of Medicine (BUSM) financial aid application is available in the link. Medical studies is a vast field to explore and this can’t be better understood without a tinge of technology alongside. This is the era of technology which has changed the way we work. The best way to reach out for all the troubles you face in the medical studies is by giving yourself the exposure to Dr. Najeeb lectures. Dr. Najeeb has been teaching medical sciences for over 26 years and is the source of assistance for millions of students from all over the world. The lectures delivered by Dr. Najeeb cover all the topics of medical and clinical sciences. His latest teaching methods, with visual representation of illustrations and extensive coaching has blessed a lot of medical students with crystal clear concepts. Almost all the topics that are part of the curriculum of all the medical colleges worldwide are covered by Dr. Najeeb lectures, ranging from gross anatomy, neuroanatomy, embryology, histology, physiology, biochemistry, genetics, pharmacology, microbiology, immunology and pathology which are secondary sources to help medical students. This innovative online teaching method has compelled millions of students from 190 countries to subscribe to the lectures. The videos are audible and easily understandable to anyone, with vocabulary just appropriate for the medical students. Moreover you can have the last moment revision with help of these videos that will result in indelible concepts. New videos are added every week at Dr. Najeeb Lectures’ video library that are accessible to all the subscribers. You can subscribe by visiting Dr. Najeeb Lectures Official website. Review by Dr. Sarah Clifford from UK. Here’s what students are saying about Dr. Najeeb Lectures. This is singularly the best investment I made for the first year of medical school. Each video is a jackpot of information with amazing drawings, great energy, and a phenomenal professor! Currently, the only things saving my embryology and 1st-trimester ultrasound marks - keep the wealth of education flowing! Highly recommended! I bought lifetime access because I believe there is no better source for learning the foundation of medicine. I strongly recommend him to anyone who cares about true learning and not merely memorizing! Dr. Najeeb Lectures are top notch. Comprehensive medical lectures of the utmost quality across all preclinical (and many clinical) topics. Fantastic for deepening one's understanding for clinical practice and licensing/board examinations. Dr. Najeeb is the single most spectacular medical teacher you will ever have! I love this man. He has clarified everything from the coagulation cascade, immunology, neurology, and embryology. His sense of humor and brilliant illustrations make everything stick well in your memory. His ability to illustrate 3-dimensional relationships has been useful for excelling in anatomy. I cannot thank you enough for all the wonderful work you do. I recommend your lectures to anyone who wants to truly understand medicine! Ann Ilaria Mayrhofer London School of Hygiene. I'm grappling with my online studies in Infectious Disease at London School of Hygiene and Tropical Medicine. It's made me realize what a visual learner I still am. So these vids are making what was murky crystal clear. While I am easily distracted when I have to do hours of straight reading, I am glued to the videos. I've looked for a series of such videos for months. A million thanks - Dr Najeeb has a true passion for teaching and can convey highly complex topics in an understandable and fun way. Copyrights © 2019. Dr. Najeeb Lectures.